Match Rajasthan Royals Vs Royal Challengers Bangalore. Venue Sawai Mansingh Stadium, Jaipur. IPL is getting on the nerves of every cricket fans and yes they are expecting this season to be more energetic, fun and sporty of all time. IPL 2019 has come up to the 14th match of its season with Rajasthan Royals and Royal Challengers Bangalore. This match will be played in full heated energy. This match will be spectated in the stadium of Sawai Mansingh Jaipur at 8:00 PM (IST). Teams will be looking forward to an enthusiastic crowd with a lot of effort from their players. At this ground, Rajasthan and Punjab have been in touch and had a run fest. With that pitch hardness players have to deal with the temperature of 40oC and crowd expectations. Both teams have not been in the fixtures of any injuries in any of the aspects but yet RCB will be hunting their balanced best of playing XI. 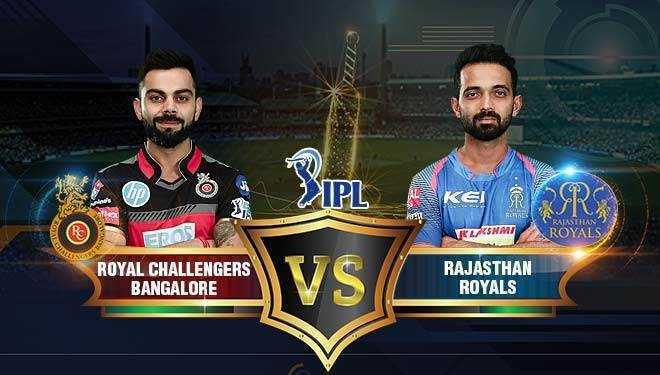 Before this match, RCB and RR have been encountered 19 of the matches with wins of 9 in the favor of RR and 8 in RCB, while 2 of the games have resulted in nothing. RCB will be burning the heads to get a team with win strokes and RR will be moving on the field with their previous squad and fewer chances of changes. Ajinkya Rahane, Krishnappa Gowtham, Sanju Samson, Shreyas Gopal, Rahul Tripathi, Ben Stokes, Steve Smith, Jos Buttler, Jofra Archer, Dhawal Kulkarni, Shashank Singh. Virat Kohli, AB de Villiers, Parthiv Patel, Shimron Hetmyer, Shivam Dube, Umesh Yadav, Yuzvendra Chahal, Mohammed Siraj, Moeen Ali, Colin de Grandhomme, Prayas Ray Barman.